When it comes to creating a repeatable and consistent golf swing, many instructors spend time focusing on band aids or temporary fixes that never really get you set for success. At RotarySwing.com, we believe band aids for golf swing problems are a bad idea. We prefer to give you solutions and systems that fix the problem and create a foundation for future success. As a key foundation point in your golf swing, tweaking your grip to fix a problem in your swing is only going to mask the real golf swing problems you have and hinder your progress. That's why we are going to show you how to accurately and consistently build the perfect golf grip that will work for you every time. Checkpoint 1: Grasp the club near the tips or base of your fingers with your left hand being careful not to over-squeeze the club. If you're a left handed golfer, obviously your initial grip starts with the same movement in your right hand. Grip pressure is a 2 to 4 out of 10, so you're gripping the golf club very loosely. Once you have the club grasped, you want to pinch your thumb and index fingers pinched together so that your thumb is pointed down the shaft and you see no "open" v in your fingers. Checkpoint 2: Strong Golf Grip vs Weak Golf Grip - When it comes to "strong golf grip" or "weak golf grip" golfer instructors are not referring to how hard you are gripping the golf club. A strong grip infers that the club head at impact will be closed and weak grip is defined as the clubface will be open when you strike the ball. Obviously, strong and weak grips come with consequences. A strong grip will promote a hook and a weak grip will promote a slice. What we're aiming for at RotarySwing.com is consistency, so developing a neutral golf grip is the only way to build a solid foundation. Here is the best way to get a grip on the golf club to achieve a neutral club head position. Standing upright with shoulders not rounded forward, place the club on your right inside thigh. Reach over with your left and take your initial grip, but make this important double check now: As you move the club into the middle of your stance, make sure you can see 2 to 2 1/2 knuckles as you look down at your hands this erect standing position. By checking your knuckles, you ensure that your grip will not promote an open or closed clubface at impact. Checkpoint 3: Interlock golf grip vs. overlap grip - Literally, there is no right or wrong answer here. This is all about feel and comfort and whichever feels right and comfortable to you is what we recommend. No matter what golf grip you choose to use, interlocking or overlapping, the key checkpoint is to make sure that your left hand V at address is pointed over your right ear and your right hand V is aligned up your right arm at your right shoulder. By checking the V alignment of your grip as we have outlined above, you can be always sure that your grip is set up correctly at address. So one of the most common mistakes in golf instruction these days is the band-aid fix of changing your grip. So if you've battled a slice or a hook, the first thing that golf instructors tend to turn to is what you're doing with your grip. Well, did you know that that grip change could essentially be costing you tons of club head speed and making it nearly impossible for you to square the club face up at impact? Yeah, that's right. Hi guys, I'm Rotary Swing instructor Chris Tyler. In today's video we're going to be talking about a detailed list of checkpoints to get you a good solid foundation, and a good grip to start from so that you're not costing yourself any more speed and putting band-aids on your swing any longer. Let's go ahead and get started. Okay guys, so the objective of today's video is not to spend a lot of time going into the sciences behind how your grip can affect your release or how it can affect your swing plane. We've got a couple videos on the website that can help you out, they really dive further into the sciences behind that. The goal of today's video is to look at this and give you a couple of clear checkpoints on how you're going to approach your grip, and make sure that you're not affecting your golf swing. So let's go ahead and take a look at checkpoint number one. Okay gang, so the first checkpoint I want to show you today is how we're going to have the club resting in our left hand. Or lead hand if you're a left-handed player. Okay so the point of this is where we want to make sure the grip of the club is resting right at the base of the fingers. Okay, not up all the way in the fingers, not down here in the palm. Right across the base of the fingers. That's our first checkpoint here, and then we're going to let our fingers wrap around it. Now what I want you to pay close attention to, and this is where we talked about a short thumb, is we want to have our thumb and our pointer finger pinching together. Not tight, but you want to make sure that when you grab the club that you make this "V" and it's put together. If you're thumb's over here on this side you're going to potentially lose control of the golf club at the top of the swing. So, checkpoint number one is get the golf club to be right at the base of the fingers, and go ahead and wrap your hand over the top just like so, and have this thumb and your pointer finger pinched together just slightly. Okay so now that you've seen checkpoint number one, let's look at checkpoint number two. This is going to help you with how strong or weak of a golf grip that you should be having anatomically in your golf swing. I want you to take your set up position, no golf club in your hand. You can rest it against your right thigh here. I want you to get into a good neutral posture here with your shoulders, don't let your shoulders round forward here. Get your shoulders to where they're a nice neutral posture. Your goal here is that we're going to slowly, and we're going to keep that pointer finger and our thumb pinched together, we're going to slowly move our arm across to our center. So our left arm is right underneath the logo on my chest. I'm going to slowly let is swing underneath, my shoulder stays neutral, it doesn't round forward to where my palm is now facing in. Okay, so you can see here now my left arm is moved across. Now what I want you to do at this point is go back to checkpoint number one, and go ahead and let the club get right into that hand the same way. What your goal here is, without having to look and go see it or change or manipulate your hand position, I want you to be able to see about two to two and an half knuckles. That's a good focus point for you. So two to two and half knuckles, that's what I can see here without having to change. Okay so that would be checkpoint number two. Now we're going to learn how to get the right hand back on the club. Okay, so now let's talk about how to get that right hand on the golf club. This is where golf instruction tends to go back and forth on things as far as, should we interlock or should we overlap. There's no real data that supports either one being better than the other. I personally use an interlock grip, and the reason for that is that I feel like I've got more control of the golf club because I've got a little bit of shorter fingers. I've got a little bit more of a fat, fat palm, and it allows me to feel like I've got control of things. I did try the overlap grip again, it felt like I didn't have as much control of the face. That's really the most important part of golf is making sure that you can control that thing down in the hitting area, and release it with tons of speed at the same time. So I'm going to show you guys the interlock grip first. So the first thing that we want to do when working on an interlock grip, is we're going to get the club in our left hand again just as the way we did in checkpoint number one. Make sure your thumb and your pointer finger are pinched together just slightly. Not tons of tension there, remember we want our grip pressure to be between a two and four on a scale of one to ten. What we're going to do here is we're going to lift the club straight up in the air, and we're going to point our pointer finger back at you at home here. Okay? Now with my right hand what I want to do is almost make one of those little shadow puppets that we used to do as kids back in the day. So you can see I'm making that little shadow puppet dog. I'm going to have my pinky down here, and then what I'm going to do is bring my thumb down into that same position that I showed you with the left hand. Our goal here is, as we start to move the right hand in, we're going to interlock these two fingers. You're going to hold the golf club at that same point, right at the base of the fingers where it meets your palm. Then you're going to go ahead and wrap your fingers around it and then place your hand right on top of the club. So you can see that club moves in, fingers around it, and now I've got my pointer finger and my thumb close together. So that is the interlock grip. Now your final checkpoint here, to make sure you're in a good position, is that this "V" right here should be right up at your right ear. And this "V" right here should be bisecting your right shoulder. So now if you watch, going back to checkpoint number two, when I move my left hand across, now I'm going to move my right hand in the same way. You can see that I've got that "V" right up my right shoulder, and this "V" is right up by my right ear. Okay so those of you that feel comfortable with the overlap grip, it's going to be done the exact same way. Except for, instead of making that little pointer gun here back at you at home, we're going to keep that finger right on the gold club. Still maintaining that little pinch between the thumb and the pointer finger here. We're going to make that same shadow puppet here. Thumb down, and rather than locking these two fingers together, we're going to take our pinky and overlap it between the pointer finger and the middle finger. Then we're going to make sure it's resting in the same spot, right at the base of the fingers. Go ahead and set the club down, and your same checkpoints here are the "V" right up at your right shoulder in the right hand, and your "V" in your left hand is right up at your right ear. Okay guys, now that you've seen your golf grip checkpoints let's recap this so you have a good clear understand at how you're going to do this at home. So what I want you to do is get your setup position right here, and rest the golf club across your right leg, good neutral posture. I want you to slowly bring your arm into center here to where it's underneath your logo on your chest. Pointer finger and thumb are pinched together. We're going to go ahead and get the club in our left hand just like we talked about in check point number two. Okay, I can see two to two and a half knuckles without having to go over there and look at it. I'm going to reach across now with the right hand, interlock grip, and now my "V" in my right hand is up towards my right shoulder. My "V" in my left shoulder is up toward my right ear. So use these checkpoints to make sure your grip's in a very good spot to start your golf swing off. You don't need to start to strengthen your grip, you don't need to weaken your grip based off a hook or a slice. 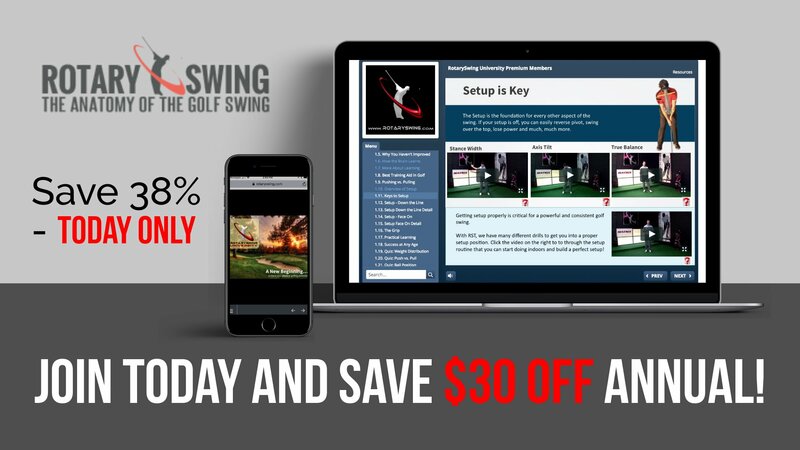 There are probably other contributing factors to your hook or slice, such as path or club face, and those things need to be addressed with other fixes to the golf swing. So let's get out there and play some great golf. Get Your Free Membership to Finish Watching "Golf Grip Checkpoint Tips" Right Now!